Again we started our ride on US 60. After 8 miles, we turned east on SR 74, with signs suggesting road work ahead. We had a brief pause for one lane traffic, then discovered that the road had recently been paved – a wonderful wide, smooth shoulder. 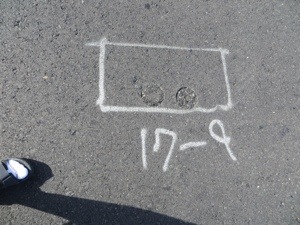 I did become curious about some marks on the road in regular intervals, and was able to ask a surveyor about them: core samples to confirm 2 new inches of asphalt had been laid. Thanks to the recent construction work, we discovered “stray” port-a-lets along the road, surprisingly clean. I have been fascinated by the changing “vegetation”. Yesterday on US 60, there was mostly scrub brush, very little green. 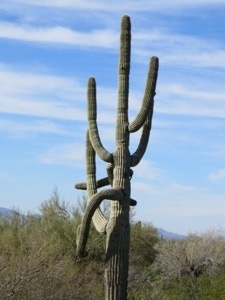 Today the saguaro cactuses were quite tall with more arms than we have seen the past days. 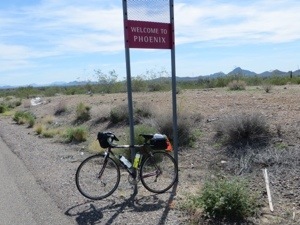 Just over 30 miles into the ride, I passed this sign indicating the city limits – still had another 30 miles or so to go. 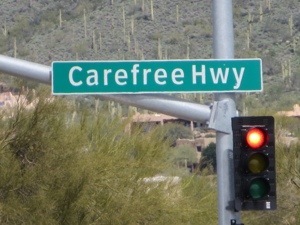 The route was along the Carefree Highway, which did not live up to its name. 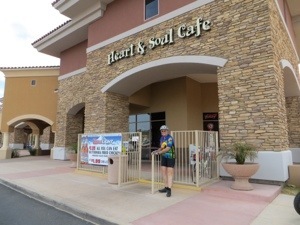 My energy was depleting fast in the midday heat, and I came upon Jo from our group, and we were able to have a cool lunch at the Heart and Soul Cafe – I think we both felt we had given heart and soul to the ride this morning. 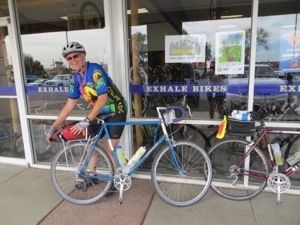 With renewed strength, we pedaled the remaining 15 miles, our goal a local bike shop where many from our group planned to make purchases and have bike adjustments – I bought a pair of sun sleeves to protect my arms from the sun’s rays. 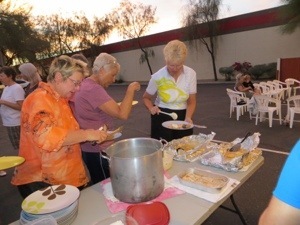 Special dinner tonight (poached salmon), as we say goodby to Bell Brinn, who injured her shoulder on day one. In Blythe, she found out it was separated, so she is headed home tomorrow. She has been such a trooper this past week, in some pain, and knowing her dream must be postponed. My roommate tonight is Beth Walsh from Southport, CT. She is a financial analyst for Americares, and has only recently gotten into cycling. Total miles 77, average 12.6. 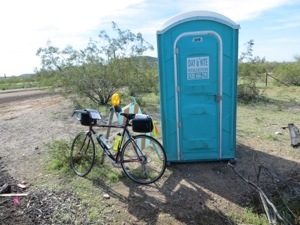 Joe Anderson used to say that if you come upon a porta potty, just assume they placed it there specifically for your ride! Enjoy! Writing from Indianapolis! Everyone at the Rogers house says hello and we are cheering you on! Dad brought Mom home yesterday. Caregivers will be here each day 8-8 each day. They will take one day at a time. Mom is thrilled to be home. Enjoying your awesome coverage of your trip. I feel like I am right there with you! (well..almost).It has to be just wonderful! Hey Dolly, Love hearing about the ride. The heat must be a bit of an adjustment. 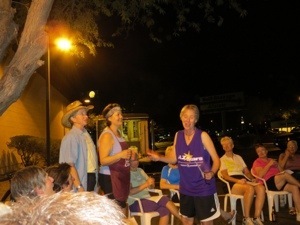 We were in Scottsdale just a couple of weeks ago for a soccer tournament. There was snow on the hills which residents said they hadn’t seen in 10 years! so be happy. It is drizzly and windy today in Seattle so a typical day here! Your observations are so cool to hear. Now if I see a series of circles on new asphalt I will know what they are!